Companies have caught up to this and opinions have become a topic of interest for many of them in recent years. Because of the huge amount of available opinions, it is impossible for a human to read them all, so an automatic method of analyzing them is necessary: Sentiment analysis is born (sometimes also called subjectivity analsyis or opinion mining). In its most basic form, sentiment analysis attempts to determine whether a givne text expresses an opinion and whether this opinion is positive or negative. 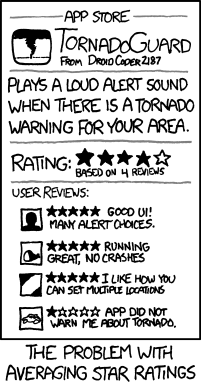 While it is nice that the app has a good UI and runs smoothly, a user might want to assign more weight to the review that discusses the aspect of "warning about a tornado". After all, this is the main functionality of the app and probably the main reason of getting it. Everything else is an added bonus. Besides identifying reviews that discuss the important aspects of an item, real reviews usually also contain opinions on a variety of aspects that may be evaluated quite differently by different users ("I liked the UI, but I hated the alarm tones"). So a more detailed analysis is necessary, and this is what makes sentiment analysis interesting! This entry was posted in NLP and tagged aspect-based sentiment-analysis, introduction, sentiment analysis, tornadoguard, xkcd by swk. Bookmark the permalink.